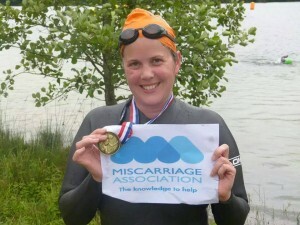 “My wife and I had 2 horrific miscarriages. We did not know where to turn. I did not know what I could do to help but one day when searching on line I found a link to Bristol Miscarriage Association. They were so helpful and friendly. Sarah, Nick and Jacqui said I should bring her down. She was so nervous (I waited outside in the car). They were so supportive and made her feel better. Eventually we fell pregnant again and in August of last year my wife gave birth to my gorgeous Daughter Eleanor. We could never thank those heroes in Bristol enough but my wife wanted to do something to say thank you. She set her mind on the Big Cotswold Swim, an open water swimming competition near Cirencester. She could swim a bit but not well (certainly not a mile) she could not swim front crawl either. She trained hard, took lessons and yesterday completed the race in a great time. I have only been more proud of her once and that was when she gave me my beautiful little girl.